Micha R, et al. Association Between Dietary Factors and Mortality From Heart Disease, Stroke, and Type 2 Diabetes in the United States. JAMA. 2017;317(9):912-924. doi:10.1001/jama.2017.0947. FDA and EPA (2017). 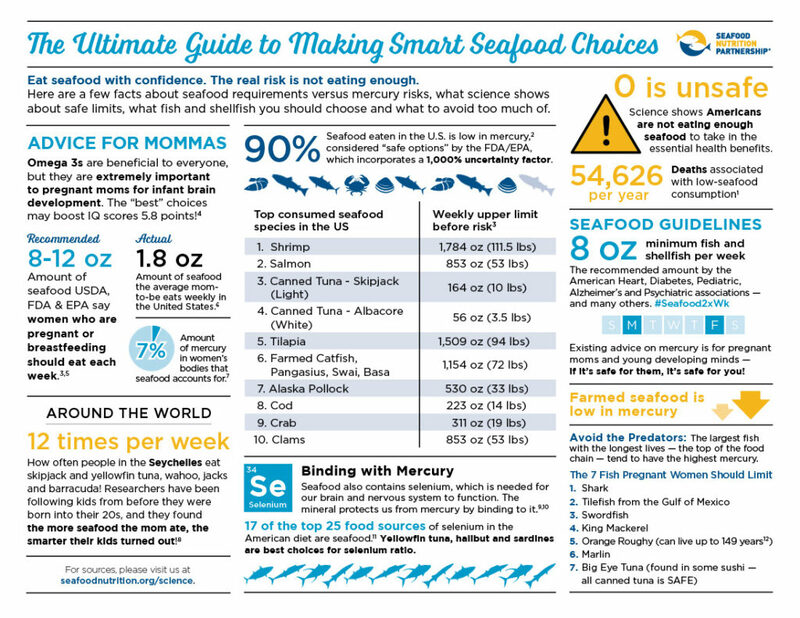 Eating Fish: What Pregnant Women and Parents Should Know. Page Last Updated: 11/29/2017. HHS and USDA (2015). 2015-2020 Dietary Guidelines for Americans. 8th Edition. Lando AM, Fein SB, Choinière CJ. Awareness of Methylmercury in Fish and Fish Consumption Among Pregnant and Postpartum and Women of Childbearing Age in the United States. Environmental Research, vol. 116, pp. 85-92, 2012. Golding J, Steer CD, Hibbeln J, et al. Dietary Predictors of Maternal Prenatal Blood Mercury Levels in the ALSPAC Birth Cohort Study. Environ Health Perspect; DOI:10.1289/ehp.1206115. Davidson PW, et al. Fish consumption and prenatal methylmercury exposure: Cognitive and behavioral outcomes in the main cohort at 17 years from the Seychelles child development study. NeuroToxicology. Vol 32, Issue 6, December 2011, Pages 711-717. Sherlock J, Hislop D, Newton G, Topping G, Whittle K. Elevation of mercury in human blood from controlled ingestion of methyl mercury in fish. Hum Toxicol 1984;2:117-131. Ralston N, Raymond L. Dietary selenium’s protective effects against methylmercury toxicity. Toxicology. Vol 278, Issue 1, 2010. USDA National Nutrient Database for Standard Reference. https://ndb.nal.usda.gov/ndb/. Bulman CM, Koslow JA. Diet and food consumption of a deep-sea fish, orange roughy Hoplostethus atlanticus (Pisces: Trachichthyidae), off southeastern Australia. Marine Ecology Progress Series. June 1992. 82: 115–129. doi:10.3354/meps082115.